Hello, friends. It’s been so long since I’ve posted… have you forgotten about me? I’ve been lost in a whirlwind of work-completing, house-packing, stuff-moving, house-unpacking, baby-growing, and more recently, baby-waiting, that I just haven’t been able to take the time to pull together something worthwhile to share with you. And to be honest, nothing really has changed- I still don’t exactly have anything new for you. But, in an attempt to re-institute some kind of order in my life by organizing my photo file folders on my computer (which, somehow, is more appealing than organizing the boxes of actual files clustered around the floor of my new home office), I found the photos of this chocolate almond toffee that I took back in December. And I got a little bit upset with myself. How have I waited this long to share this toffee with you? Have I reached such a crazy level of self-involvement that I can justify keeping this delicious, buttery confection from you?! Nay, dear readers, nay. 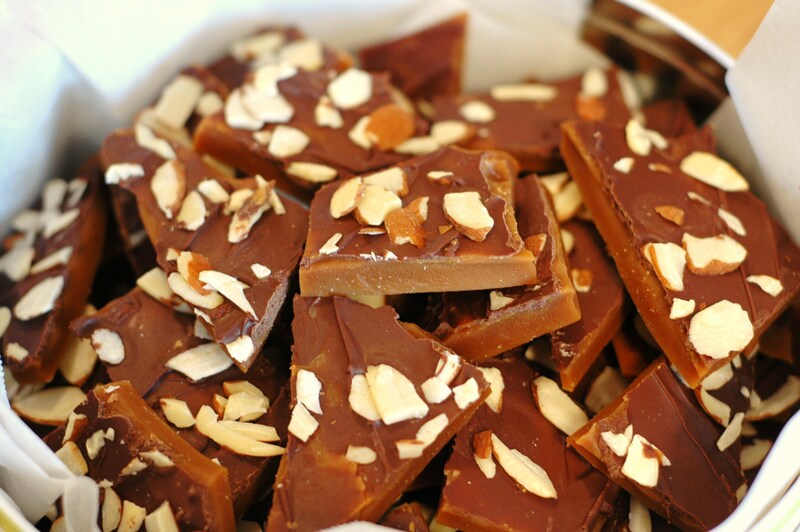 The time has come to bring you… the best toffee that I have ever eaten in my entire life! I can’t say for sure if it’ll be the best toffee you’ve ever eaten in your entire life, because I really don’t know for sure what kind of toffee you’ve been eating, but I can assure you that this is some really good freaking candy. Oh, and just in case you’re thinking that you’re not the candy-making type, I have a few words on that subject. If you’re not the candy-making type, maybe you should become the candy-making type. Making candy is, most of the time, pretty simple, and the results are always much, much better than anything you can buy in a store. And bringing candy is a surefire way to make sure you’re the most popular person at a party. 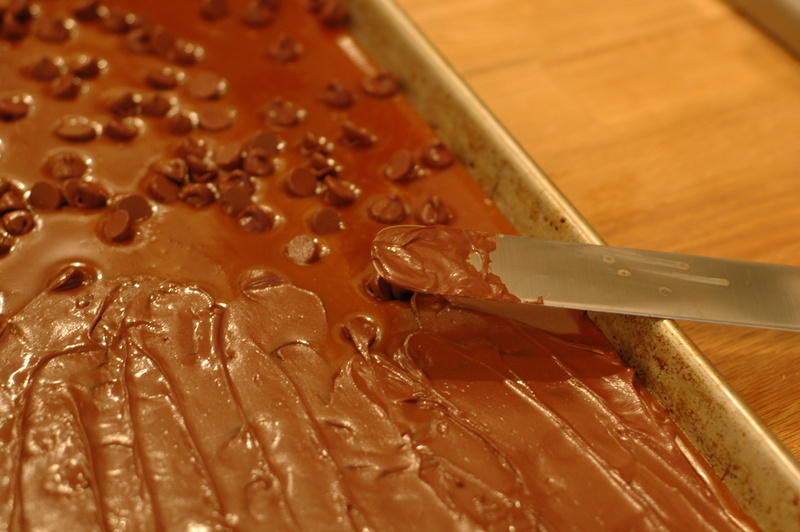 This recipe pretty much sums up everything that can be awesome about making candy. It’s super simple, quick, and addictively delicious. 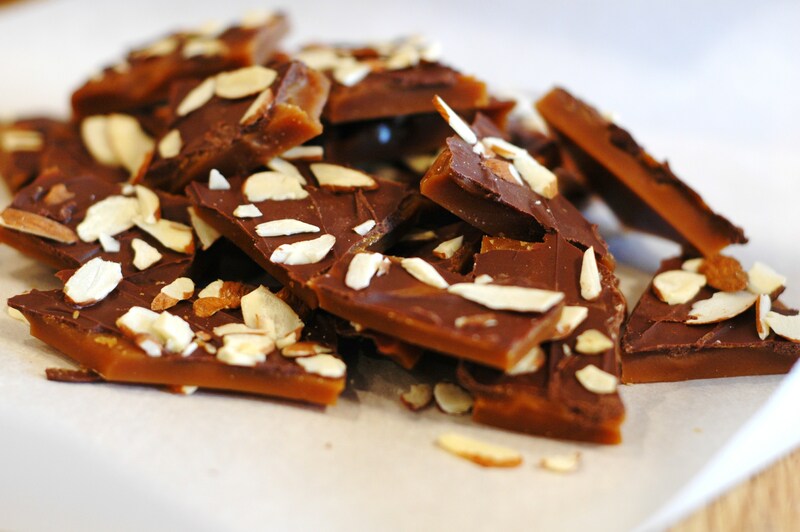 The toffee itself is buttery and rich, but with that crackly snap that I find to be the essence of toffee-ness. Somehow, it manages to be not too sweet, which is interesting because it’s pretty much just caramelized sugar. Oh, caramelized sugar and butter. There IS a lot of butter, but you really have to remember that all that butter makes a lot of candy, so it’s all, you know… spread out. I’m not going to try too hard to justify the butter situation here, because heck, it’s toffee, what do you want? The chocolate layered on top with the slivered almonds are so necessary, even though the crispy toffee is the real star. The chocolate adds the creamy richness that it needs and the almonds… well, I don’t know about you, but I think some slivered almonds make almost anything more delicious. I hope by offering you candy, I’m making up in some small way for being so negligent. I’d promise to be better from now on, except I have a sneaking suspicion that once this little one decides he’s had enough of the view from inside my belly and makes an appearance, I just might be even busier and almost certainly more sleep-deprived. But I can promise that I’ll do my best, how’s that? I’ll even go right now and dig through the still-packed boxes to find my camera, in anticipation of the great recipes that will hopefully be coming your way soon! 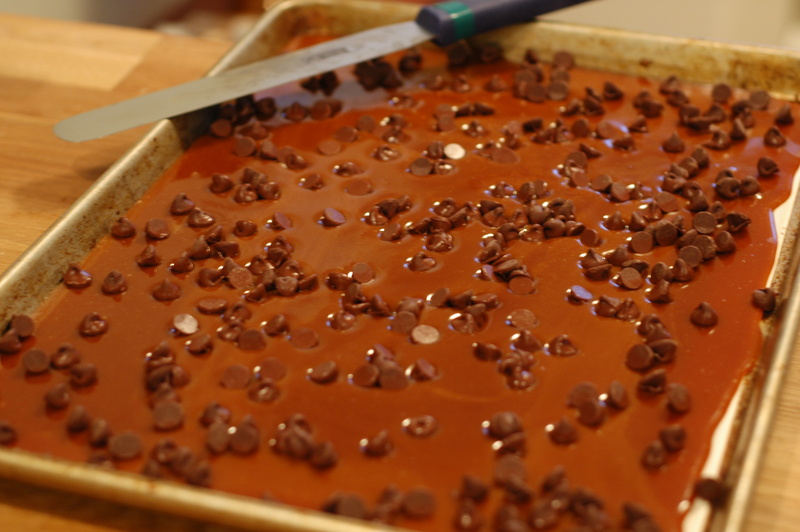 A note about the chocolate: I used chocolate chips, which is totally fine if you’re going to be eating or gifting the toffee relatively quickly. 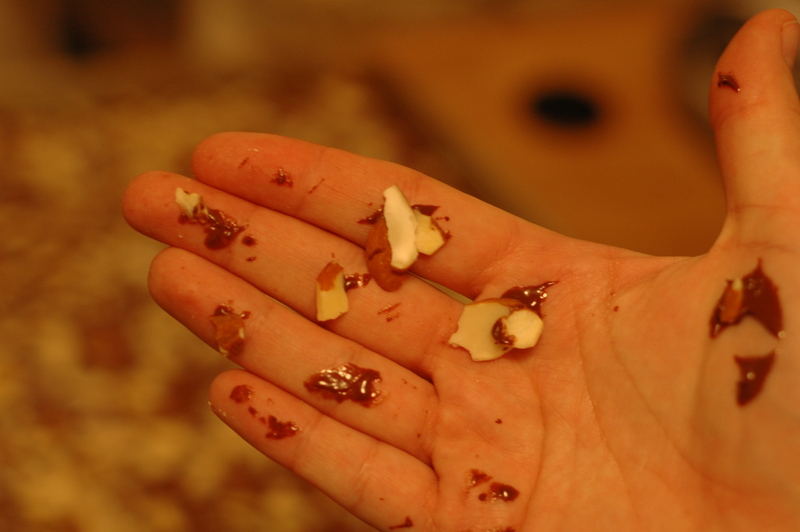 Most chocolate chips aren’t tempered, which means when it cools, it won’t have that sheen to it, or the snap that a chocolate candy coating would have. It might also bloom (get those little white spots on it) after a few days. It’s perfectly harmless, but if you want your toffee to stay pretty, then I recommend using bars of semi-sweet chocolate, chopped. Tasty either way! Line the bottom and sides of a 10-inch x 15-inch baking sheet with parchment paper. 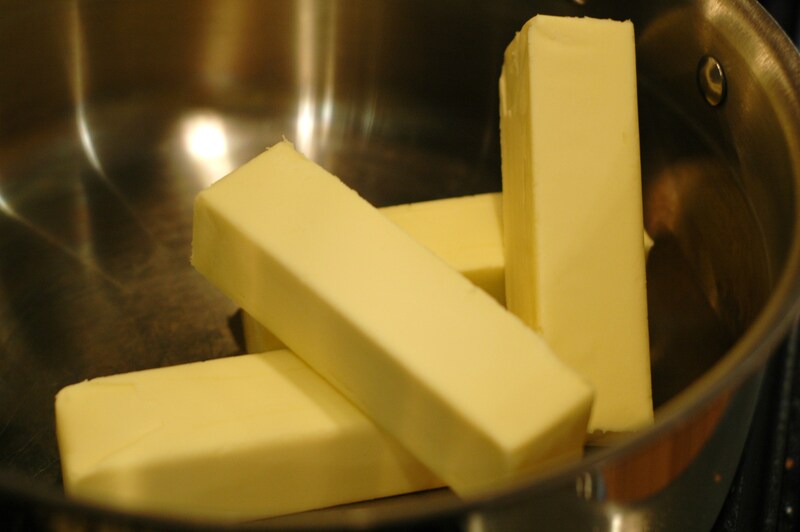 In a large cast iron skillet, melt the butter over medium high heat. As the butter melts, stir in the sugar and salt. Continue stirring constantly and rapidly with a wooden spoon, keeping the sides of pan clean by brushing occasionally with a wet pastry brush. 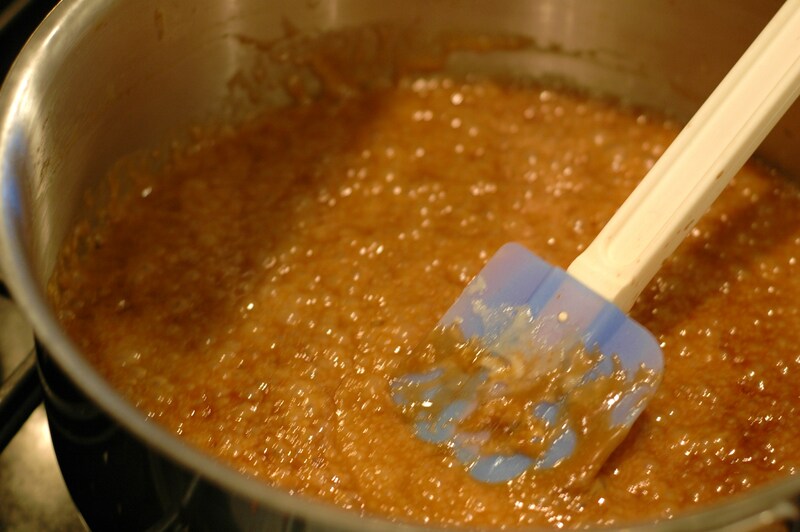 The mixture should bubble as you stir. Cook until the mixture turns a deep golden brown, taking care not to burn it. Remove from the heat and stir in the vanilla. 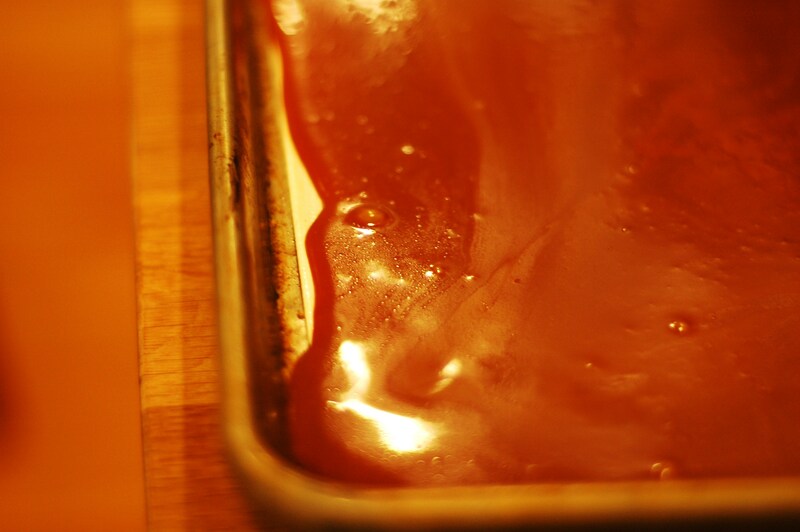 Cool completely (at least 6 hours) then break the toffee into chunks.